Those living outside North America may not know that a boardwalk is a sort of wooden promenade laid alongside a beach so that passers-by can enjoy an ocean view without getting sand in their shoes. As a boardwalk provides a level surface and the shoreline is seldom completely flat, there is often space underneath. Atlantic City is about a hundred miles from the boardwalk of Coney Island under which the sixties hit song is based. Atlantic City has a boardwalk of its own, and one so-well known that it is one of the Blue properties on the US version of the Monopoly board game. While Frank Sinatra, Marylin Monroe and the Beatles have all trodden these boards, until recently few paid much attention to the colony of some 200 feral cats sheltering just below them. 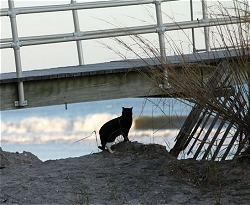 In fact no-one knows when the first feral cats took up residence under the Atlantic City Boardwalk, but it was probably soon after the walk itself was built in the 1880s. Until the start of this century the cats were tolerated by the city authorities. After all, they were not unattractive, and they ate scraps from fast food dropped by tourists and kept down vermin. However, the cat population began to expand - mostly because the boardwalk cats were not neutered, but also probably because some heartless residents of the city decided that the boardwalk was a good spot to abandon unwanted domestic cats. It is a popular delusion that domestic cats can readily adapt to a wild existence. In reality cats accustomed to being completely dependent on humans suffer after being abandoned. In any case Atlantic City authorities decided that the cats posed a health risk, and it was decided to kill off the colony altogether. The Allies know that exterminating cat colonies is rarely successful - feral cats are incredibly resilient, and the size of a colony is usually determined by the number of cats it can support. Cats breed quickly and there are always dozens of kittens ready to replace any cat which is killed. And if the cat colony were to be successfully eradicated, other feral cats would move in. And even if they did not, this would simply leave the authorities with the problem of dealing with the rodent colonies which would quickly replace the cats. Atlantic City accepted the Alley Cat Allies advice that a TNR scheme was a much better solution than extermination. TNR improves the lives of feral cats through neutering, and keeps them out of animal pounds and shelters where they are killed. It is the most successful method yet discovered for controlling feral colonies and improving the lives of the cats that live in them. So in the summer of 2000, each of the cats living under the boardwalk was trapped and transported to a shelter. If a cat was a genuinely feral animal then it was treated with respect and returned to its habitat after being neutered and 'ear-tipped'. 'Ear-tipping' involves cutting off the very tip of one ear. This does the cat no harm, and indicates that it has already been neutered. As expected, it was discovered that some cats were 'socialized' (accustomed to the close company of humans). These were probably abandoned domestic pets, and they were found homes with caring humans. Today there are signs warning of strict penalties for abandoning cats on the boardwalk, and the TNR program has stabilized the cat population at about 175 cats, almost all neutered. Volunteers come from all over New Jersey and Pennsylvania to care for the cats. There is a feeding and volunteer schedule run by one of Alley Cat Allies' program managers and this ensures that the animals have sufficient food and shelter, even in winters such as that of 2010-11, when the Atlantic Coast was buried in a series of massive snowstorms. 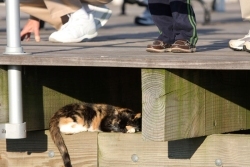 'The Boardwalk Cats project serves as a model for cities all over the country. The fact that the program has been successful for over 10 years is a testament to TNR’s sustainability' Ms Parowski says. 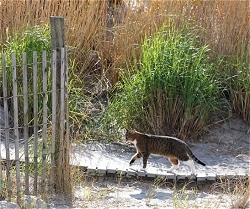 There has probably never been a better time to be a boardwalk cat in Atlantic City. The cats receive regular veterinary attention, and the volunteers even keep their habitat clean with regular drives to clear away litter. And the sleek and healthy cats of the boardwalk are now an elegantly pleasing addition to the attractions of the city's famous walkway. Not if you are a cat in Atlantic city, you won't.